Flyaway VSAT antennas are designed for anyone requiring ultra rapid and flexible deploiment of VSAT terminals, able to be transported and deployed easily by a single person in a few minutes. These easily deployable antennas use the same technology as their automatic pointing mobile satellite counterparts, but can be transported in one or more bags or cases. 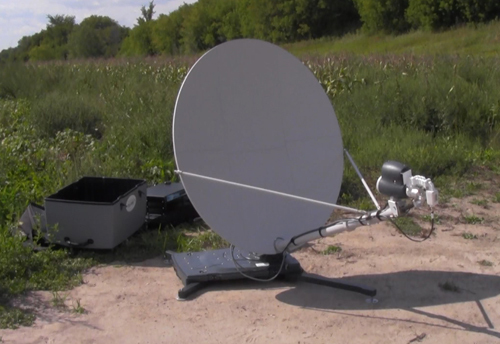 Flyaway satellite antennas are available in different sizes and either automatic or manual pointing, segmented reflectors, removeable feed arm assemblies, quick RF connectors and many other features that make them very transportable and easy to use. Readily configurable for C, X, Ku or Ka-Band space segment, our Fly Away terminals are Innovative, modular antenna designs incorporating carbon-fiber and SMC reflectors from 1.0m to 2.4m in diameter, ensure ease of use, superior performance and reliability in harsh environments.